Use either chicken or lamb in this Moroccan recipe for couscous tfaya. Tfaya refers to the sweet and spicy caramelized onions and raisins served with this dish. Some versions also include chickpeas. The ingredients call for the exotic spice blend known as ras el hanout . If you can't find it, substitute a few whole cloves and a pinch of nutmeg. You can serve the dish on a bed of instant couscous, but for authentic results, steam the couscous over the simmering meat. Fried almonds are a garnish and can be made ahead of time. Steam additional couscous if planning to offer afterward. Allow for additional cooking time if preparing lamb instead of chicken. In the bottom of a couscoussier, mix the chicken or lamb with the onion, ginger, salt, pepper, cinnamon, ras el hanout, saffron, optional smen, and oil. Over medium heat, brown the meat, turning occasionally, for about 15 minutes. Add the 6 cups of water, cover, and bring to a boil. Reduce the heat to medium and continue simmering until the meat is tender – a little more than an hour for the chicken and about 2 hours or more for the lamb. Check the level of the broth occasionally, especially toward the end of cooking, and add water if necessary. The broth should cover the meat, allowing ample sauce to stir into the couscous plus enough to serve on the side. When ready to serve, taste the sauce and adjust the seasoning to taste. While the meat is cooking, mix the 2 pounds sliced onions, raisins, sugar or honey, 1 teaspoon pepper, 1 teaspoon cinnamon, ginger, turmeric, 1/4 teaspoon salt, and 1/4 teaspoon crumbled saffron threads in a large saucepan. Add the butter and 1/2 cup water, cover, and bring to a simmer. Continue simmering for 30 minutes or longer over medium-low or low heat, stirring occasionally, until the onions are very soft and golden. Add more water only if the liquids evaporate before the onions are cooked. Once the onions are cooked and richly colored, reduce the liquids to a thick syrup. Turn off the heat, and set the caramelized onions aside. Reheat the onions prior to serving. The couscous will be steamed four times over the simmering meat. Begin this process while the tfaya is cooking. Next, work in 1/2 cup of water, in the same manner, using your hands to evenly distribute the liquid into the couscous. Transfer the couscous to the oiled steamer basket, being careful not to pack the couscous. Place the steamer on top of couscoussier, and steam the couscous for 15 minutes, timing from when you see steam rise from the couscous. Once the couscous has steamed for 15 minutes, empty it back into your large bowl and break it apart. Allow it to cool slightly, and then gradually work in 1 cup of water and 1/2 to 1 teaspoon of salt with your hands. Again, toss the couscous and rub it between your palms to break up any balls or clumps. Turn the couscous out into the large bowl again. Break it apart, and let cool a few minutes. Gradually work 1 1/2 cups water into the couscous with your hands, tossing it and rubbing the grains between your palms to break up any balls. Transfer the couscous to the steamer basket for its final steaming. Again, try to handle the couscous lightly and avoid packing it. Time your final steaming of the couscous to coincide with when your meat is done cooking. If preparing chicken, go ahead and steam immediately after adding the 1 1/2 cups of water. If cooking lamb, allow the lamb to finish cooking -- perhaps another hour -- before steaming the couscous for the last time. Place the couscous back on top of the couscoussier, and steam for a final 15 minutes, timing from when you see the steam rise through the couscous. Again, seal the joint between the steamer and the pot if you see steam escape. Empty the couscous into the large bowl, and break it apart. Gently mix in 1 or 2 tablespoons of butter, and two ladles of sauce. Spread about 1/3 of the couscous on a very large serving plate or platter, and pour a ladle of sauce all around. Arrange half of the chicken or meat in the center, and top with some of the caramelized onions and raisins. Mound the remaining couscous over the meat to conceal it, and generously ladle more sauce all around the couscous. (Reserve some sauce to offer on the side, if desired.) 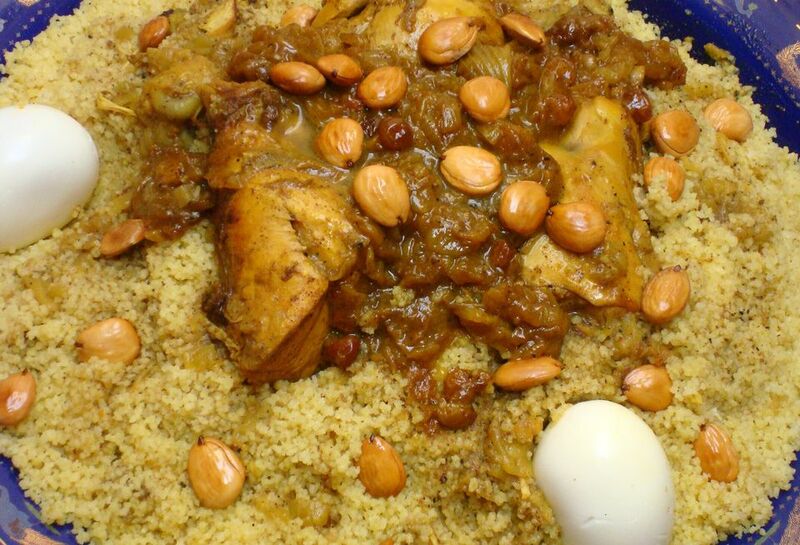 Place the remaining chicken or lamb in the center of the mound or couscous, and top with the remaining caramelized onions and raisins. Decorate with the fried almonds and hard-boiled eggs. Serve immediately. Traditionally, everyone gathers around the couscous, with each person eating from his own side of the platter.